This is another one of those bottles that, for so long, seemed to elude me, and yet again, my local corner store comes through for me. My local guy's selection is relatively small, and the hits are few and far between, but the limited bottlings he does get don't move that quickly, relatively speaking. I'm there frequently enough that, when he does get something good in, I don't miss out! So, on a recent trip to grab a bottle of wine for my wife, I saw it sitting on the top shelf as I approached the counter and I knew it had to come home with me. This was, after all, the first time I've found it in the wild. I was very eager to pop this bottle open, and I was very pleased to catch heavy caramel on the nose, with a little vanilla, and minimal burn despite the incredibly high proof. On the tongue, while the caramel was still there, it was the vanilla that took over. This pour offered the classic and traditional flavors one expects from a Kentucky bourbon, representing everything that made me fall in love with bourbon in the first place. The burn was strong, and it's definitely a sipper, but the whiskey was nonetheless incredibly enjoyable. Interestingly, toward the middle I started noticing some of the wood tones coming through, but not enough to dry it out or take away from the vanilla or caramel. Rather, it offered the right amount of earthiness to keep the sweetness from overwhelming. It also provided some additional spicy kick at the end to have me reaching for that next sip. 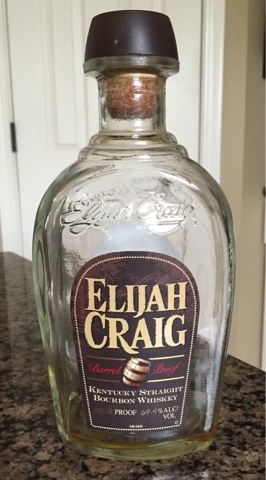 I've heard so many good things about the Elijah Craig Barrel Proof, and yet I never could seem to find a bottle. Now that I finally did, I'm wishing I had more. This stuff was great from beginning to end. Again, it reminded me of why I fell in love with bourbon to begin with. This bourbon offers everything that is great about bourbon, and it will forever be at the top of my recommended bourbons for anyone who may bother to ask.